Movie Review: After a starting career on horror with “House of Wax” and “Orphan”, Catalan filmmaker Jaume Collet-Serra teams up once again in the action-thriller genre with Liam Neeson. 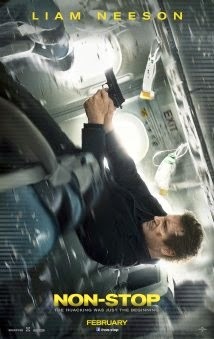 “Non-Stop” follows “Unknown” from three years ago, using the same type of sensationalist approach to tell the story of alcoholic US Marshal, Bill Marks, the only man capable to control a threatened plane in route from New York to London. Receiving text messages from an unknown terrorist passenger demanding the transfer of $150 million into a bank account, Marks will have to play tough in a scenario where everyone is suspect. With deaths occurring at every 20 minutes and a bomb onboard, our hero will get precious collaboration from some passengers on several critical moments, not without being turned into a villain due to his aggressive methods and the news considering him as the possible hijacker. Serra knows how to put tension in the scenes, especially in the claustrophobic spaces of a plane where physical confronts succeed. However, the plot is undermined by too many improbable details, involving technology and sly strategies to take the plan forward. The final moments can be panicking for those who are not comfortable flying, but the sensation felt after watching this dishonest thriller is that everything is far-fetched and even occasionally cheesy. Neeson did a competent job, while Julianne Moore and the rest of the company had discreet appearances.